If you didn't realize time is running out for holiday gift ordering, perhaps Free Shipping Day will remind you. The fourth shipping holiday this year is today, Friday, December 16th. Buy from a participating store for delivery by Christmas Eve. Chico's - Free shipping on all orders. Puma - Free shipping on all orders. Hush Puppies - Free shipping plus $10 off your order. Peruvian Connection - Free shipping and up to 40% off all orders. Sierra Trading Post - Free shipping on all orders. Disney Store - Free shipping on any order. The Body Shop - Free shipping on all orders. There are over 2,400 other online stores offering free shipping today, however, so you definitely have a lot more choices. The free shipping is offered within the contiguous United States. Note that some stores notorious for being more risky when it comes to timely delivery are also participating in the pseudo-holiday, so it might pay, still, to consider not just the free shipping offer. If you've been procrastinating about placing your online order, today's a good day to finally take shopping action. Android: Facebook rolled out its new Timeline feature yesterday, and if you've enabled the cool new interface, you can update the Android app to get it on your phone as well. The new version is mostly an interface update, but if you're using Timeline, you'll definitely want to check it out. You get the cover photo, map thumbnails, and the top-down view of all your posts. You can even swipe through albums right from the Timeline view, which is a really nice touch. The update isn't out for iOS yet, but iOS users can head to m.facebook.com to see the new changes if they so desire. Hit the link to read more. On the heels of its $40 million round announced last week, design flash sales site Fab has launched a new LiveFeed feature. 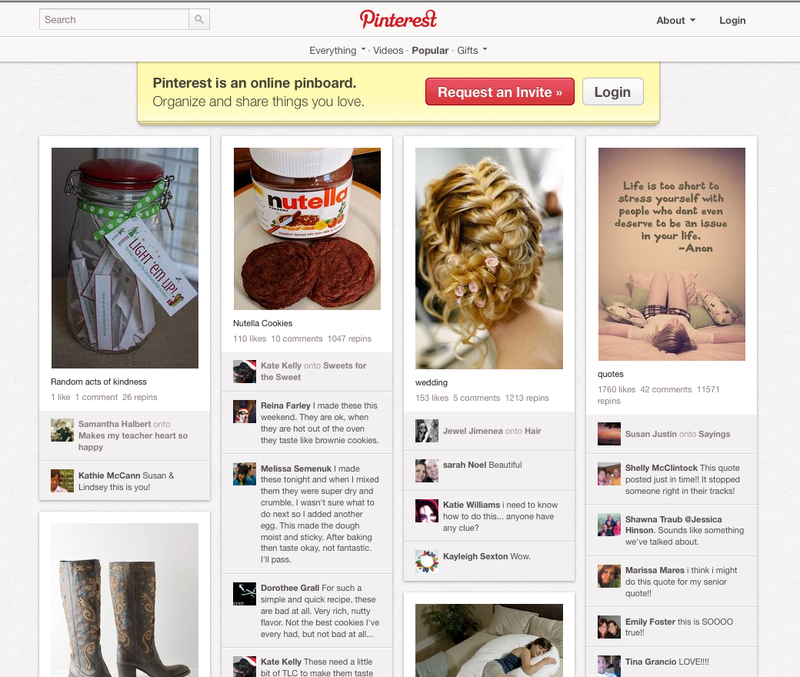 It looks an awful lot like Pinterest, the massive photo sharing virtual pinboard site. 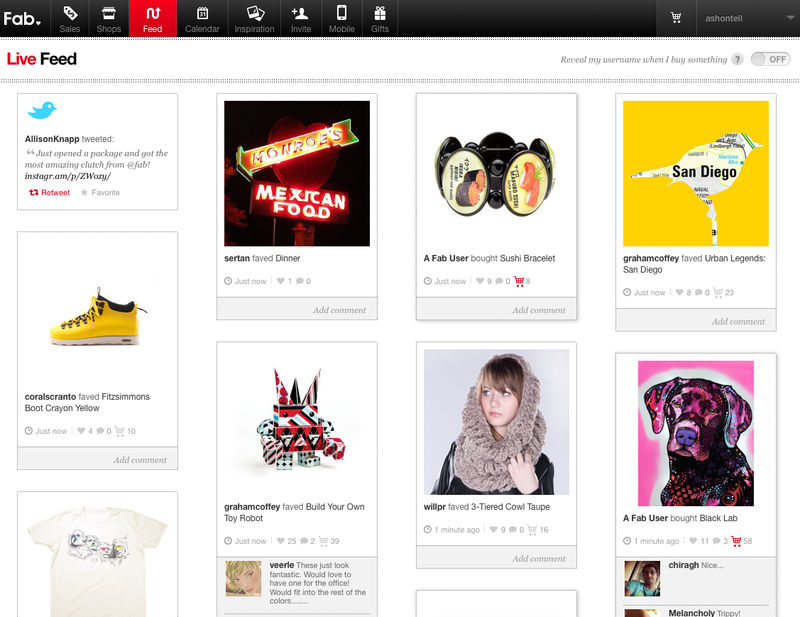 It makes Fab's site even more social in a way other e-commerce companies aren't currently doing. Andreessen Horowitz's Jeff Jordan led both Fab's $40 million financing and Pinterest's $27 million, so it's no coincidence that both design companies are sharing ideas. Fab's new feed captures all activity taking place on the site including purchasing, sharing, commenting, and more. It's a unique way to see what others are doing and buying on the site. LiveFeed is just one feature of Fab. The rest of the site and the buying experience is the same as always. Netbooks? They're already dead to us. But that hasn't stopped manufacturers churning them out. Now Dell has announced that it's killing them off — a sure sign they're done. Let's face it: Dell might sell a lot of computers — hey, even discontinued ones to the US Government! — but it's hardly revolutionary. Now, Dell has announced that it's through with netbooks, and has already stopped selling their Inspiron Minis. It also has no intention of releasing new netbooks based on Intel's forthcoming Cedar Trail platform. In other words, it is done with the category. And when a company as far from the cutting-edge as Dell announces that it's pulling out of the netbook game, it means that the breed of underpowered computers is officially dead. Gone. Forgotten forever. Don't be sad though — they were always crap anyway. A few months back we got a quick sneak peek at Microsoft's social experiment which was, at the time, called Tulalip. Now it's finally gone official and scored an even harder to pronounce name So.cl. The basic premise is this: you sign up and search for stuff (using Bing, naturally) and your queries are automatically shared with your friends. From there things get even stranger. The Video Party feature lets users group chat while watching the same clip online, but there's no video chat. You also can't upload photos, but you can make a "montage" of images collected from around the web. To kick start what Microsoft sees as less of a social and more of a learning network, the company has partnered with NYU, Syracuse and the University of Washington. Hit up the source link for more details and to add your name to the waiting list -- for now Redmond's social search toy is in a limited beta. 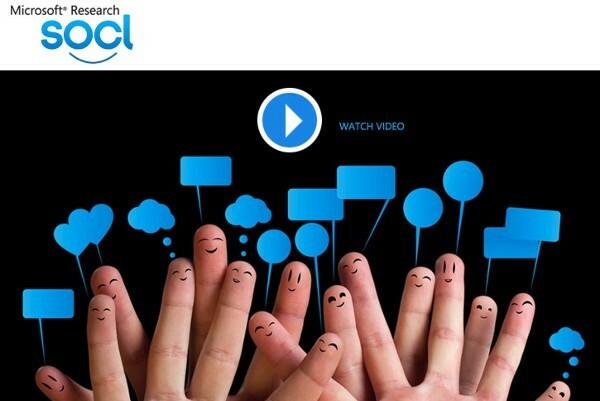 Microsoft takes the wraps off of So.cl, a search-based social network for students originally appeared on Engadget on Thu, 15 Dec 2011 18:52:00 EDT. Please see our terms for use of feeds. Hyperspectral imaging is a method that captures a far greater amount of the electromagnetic spectrum than a regular photograph. This makes it ideal for a variety of uses, from night vision to identifying mineral deposits from afar, but the problem is that hyperspectral sensors don't come cheap. However, some intrepid imaging scientists have come up with a way to turn your DSLR into a hyperspectral camera using stock SLR glass, a gel diffraction filter, PVC pipe, duct tape, some serious ingenuity and plenty of elbow grease. Thusly did they build a (relatively) cheap-as-chips imaging spectrometer that can deliver spectral resolution equal to that of commercial solutions at a far lower cost. The result of their labor is a computed tomography image spectrometer (CTIS), which takes hyperspectral images by splitting light into spectral bands with a diffuser and recording them using a Canon EOS 5D Mark I in HDR mode. As constructed, the prototype takes a spectral resolution of up to 4.89nm in a 120 x 120 pixel area, though at a longer exposure time than dedicated devices. Having proven their concept, the plan is to build another lens extension using custom tubes and lenses that'll both reduce weight and increase the aperture to shorten the exposure time -- all for less than a grand. You can see both the camera's construction and some sample images in the gallery below, plus you can dig deep into the nitty gritty behind this bit of imaging black magic at the source link. 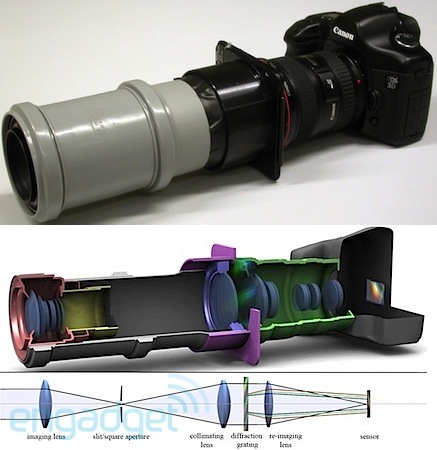 Researchers turn a DSLR into hyperspectral camera using PVC and duct tape, MacGyver green with envy originally appeared on Engadget on Thu, 15 Dec 2011 19:42:00 EDT. Please see our terms for use of feeds. A few months back, there was some concern that Intel's Ivy Bridge chipset wouldn't come with USB 3.0 certification -- planning to push its proprietary Thunderbolt standard instead. The company acted quickly to soothe the panic of gadget fans concerned they'd have to replace their new external HDDs, but the USB Implementers Forum didn't say much beyond the odd nasty snipe at the new technology. Fortunately, the crew at the USB-IF have now given their blessing toward the union 'twixt 22nm processor and super-speed universal serial bus. Since AMD jumped on this bandwagon back in April, we can pretty much guarantee that we'll be plugging flash drives in the wrong way for years to come. 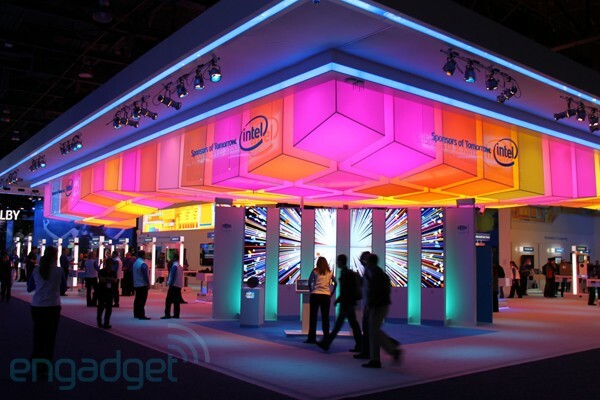 Intel not planning to run around and desert USB as Ivy Bridge gets 3.0 certification! 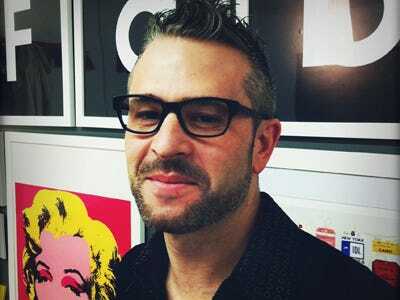 origina lly appeared on Engadget on Thu, 15 Dec 2011 20:35:00 EDT. Please see our terms for use of feeds. There's not exactly a ton to see there just yet, but a new website called Pastmapper has some pretty ambitious plans, and it's off to a fairly decent start. With a little help from the Google Maps API, it's aiming to provide maps of cities as they were in the past, complete with local business information, accurate streets, and even changes to things like hills and coastline. To kick things off, site founder Brad Thompson has debuted version 0.1 of the site with map of San Francisco as it was in 1853, including information from the A.W. Morgan & Company's San Francisco City Directory. Take a gander for yourself at the source link below -- and, if you're interested, Thompson is currently looking for some help to expand it. 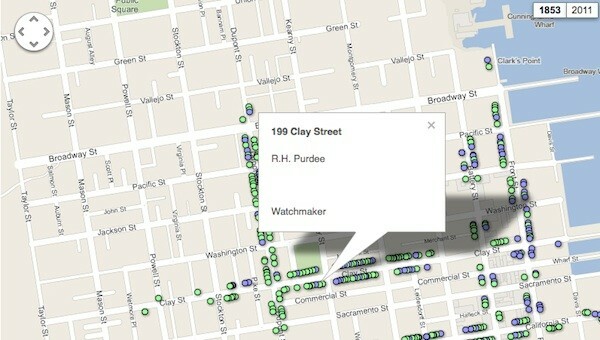 Pastmapper looks to take Google Maps back in time originally appeared on Engadget on Thu, 15 Dec 2011 22:17:00 EDT. Please see our terms for use of feeds. Electromagnetic radiation is all around us, but we're largely unaware that our bodies are constantly bathed in waves of the stuff because our eyes aren't equipped to see it. Dr. Gregory Chavat decided to give us a glimpse of an EM waveform, however, by using a coffee can radar system, a couple of LEDs, and long-exposure photography. The setup consisted of a radar emitter made out of one coffee can and a second can with a couple of LEDs attached to serve as a tethered receiver antenna. 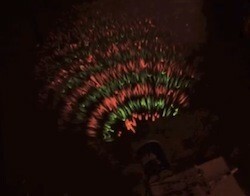 Those LEDs were then set to that light up red or green to illuminate the EM wave peaks and valleys. By moving the receiver closer and further away from the emitter while taking a long exposure photo, the good doctor was able to capture the wavefront radiating on film, and let you see the unseen with a bit of Christmas-colored flair. Check the video below for a fuller explanation, and hit the more coverage link to learn how to build a coffee-can radar and perform some basement black magic yourself. Man illuminates electromagnetic waves using coffee cans and LEDs, Christmas-colored science ensues originally appeared on Engadget on Fri, 16 Dec 2011 02:28:00 EDT. ! Please see our terms for use of feeds. VIA is hardly the first hawker of x86-based chips to start bragging about its Android compatibility, but it certainly doesn't want to be left behind as the open source OS starts worming its way into more and more machines. The EITX-3002 is the first of its offerings to sport official support for Google's OS. 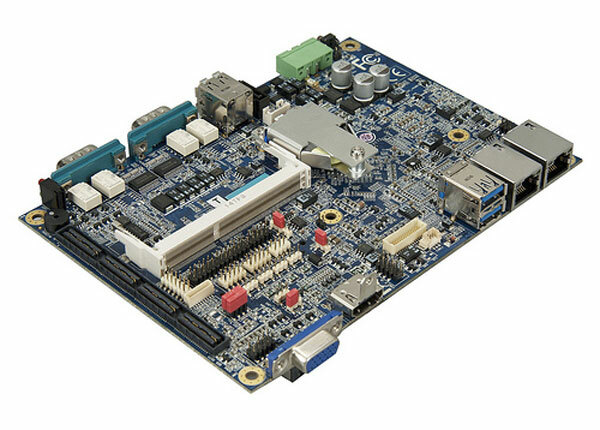 At the heart of the Em-ITX board is your choice of a 1.2GHz NANO X2 or a 1GHz Eden X2, and a VX900H, which casn push 1080p video to dual monitors. The target devices are obviously touch-based systems like in-car entertainment computers and kiosks. To see the board in action head on after the break and, please, try to stay calm -- we all know how exciting Froyo-based kiosks are. VIA adds Android support to embedded x86 line (video) originally appeared on Engadget on Fri, 16 Dec 2011 04:12:00 EDT. Please see our terms for use of feeds. Intel's Wireless Display tech has promised to pull together properly equipped laptops and nearby HDTV screens since its debut last year, but until now always required an extra add-on for the TV side of the equation. 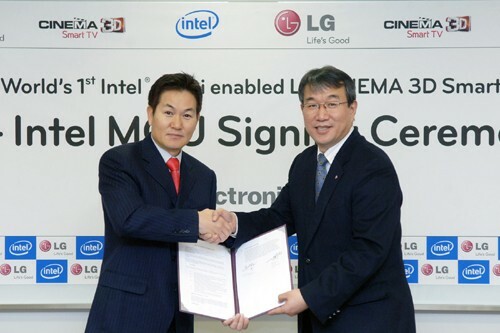 That will change next year, thanks to an agreement by the chipmaker with LG promising its Cinema 3D Smart TV line will be the first ones with WiDi built right in. Just like it does with existing dongles, compatible devices can stream content (including HDCP protected video like DVDs and Blu-rays, as of Sandy Bridge) to the display while displaying something different on their own screen, and don't require an active WiFi or internet setup to make it all happen. The press release (included after the break) promises demonstrations next month at CES, while some manufacturers like Philips have included similar technology, we'll see if this becomes a standard feature. Intel and LG deal brings WiDi streaming to HDTVs without the dongle originally appeared on Engadget on Thu, 15 Dec 2011 07:35:00 EDT. Please see our terms for use of feeds. 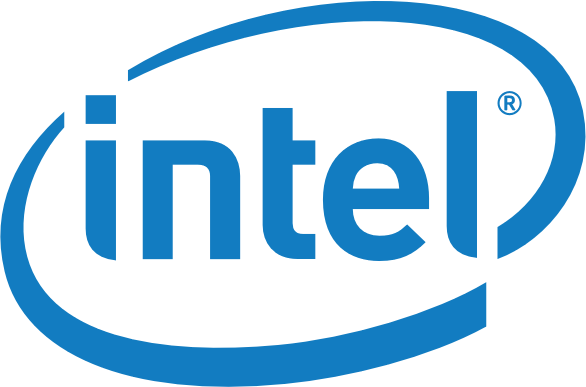 Intel is combining its netbook and tablets, ultra-mobility, mobile communications and mobile wireless divisions into a "Mobile and Communications" super-unit. It's aiming to catch up with the portable chip big boys like Qualcomm and NVIDIA. Santa Clara's chips may power 80 percent of the world's desktops and laptops, but in the mobile space the energy efficient ARM (and its multiple licensees) is king. The new unit will be headed by Mike Bell and Hermann Eul and will be in charge of speeding up the development of future blockbuster mobile chips, as well as ensuring a good launch for the 32nm Medfield when it arrives early next year -- it's got some massive dainty smartphone shoes to fill. Intel merges four mobile units into one, argument over parking spaces forthcoming originally appeared on Engadget on Thu, 15 Dec 2011 09:23:00 EDT. Please see our terms for use of feeds. Intel's NFC aspirations are hardly a secret. The company showed off a Medfield-powered tablet at IDF sporting the tech and it's partnered with MasterCard -- promising to bring PayPass checkouts to Ultrabooks. Now Chipzilla is putting the final pieces of the equation in place by landing a licensing deal with Inside Secure. The company specializes in contactless payment systems and will be lending its Microread, Securead and Open NFC products to Intel for future chips. While it's a safe assumption that we'll be seeing NFC pop up in Ultrabooks, it's also going to be an essential ingredient if the Santa Clara crew ever hopes to make x86 a player in the smartphone scene. We've still got a while to go before near field communication becomes truly ubiquitous, but this is one more step in the right direction. Check out the PR after the break. Intel enters licensing deal with Inside Secure for NFC tech originally appeared on Engadget on Thu, 15 Dec 2011 02:19:00 EDT. Please see our terms for use of feeds. 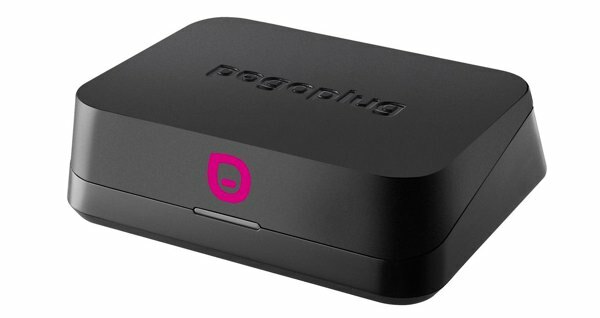 Pogoplug Series 4 expands your cloud storage, makes it easier to hibernate originally appeared on Engadget on Wed, 14 Dec 2011 11:00:00 EDT. Please see our terms for use of feeds. 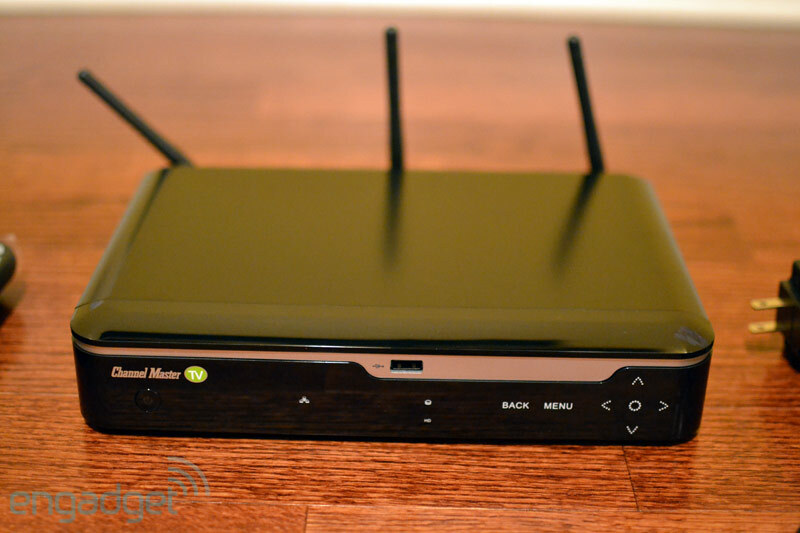 Channel Master TV review originally appeared on Engadget on Wed, 14 Dec 2011 16:00:00 EDT. Please see our terms for use of feeds. A few years back, Intel prognosticated that NVIDIA's CUDA technology was destined to be a "footnote" in computing history. Since that time, Jen-Hsun Huang's low level virtual machine (LLVM) has more than proven its worth in several supercomputers, and now NVIDIA has released the CUDA source code to further spread the parallel computing gospel. This move opens up the LLVM to be used with more programming languages and processors (x86 or otherwise) than ever before, which the company hopes will spur development of "next-generation higher performance computing platforms." Academics and chosen developers can get their hands on the code by registering with NVIDIA at the source below, so head on down and get started -- petaflop parallel processing supercomputers don't build themselves, you know. 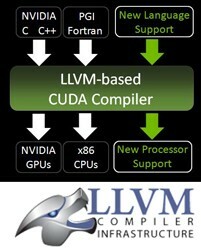 NVIDIA open sources CUDA compiler, shares the LLVM love with everyone originally appeared on Engadget on Wed, 14 Dec 2011 22:19:00 EDT. Please see our terms for use of feeds. Google buys Alfred-maker Clever Sense, brings us closer to personal Batphones originally appeared on Engadget on Wed, 14 Dec 2011 09:08:00 EDT. Please see our terms for use of feeds. 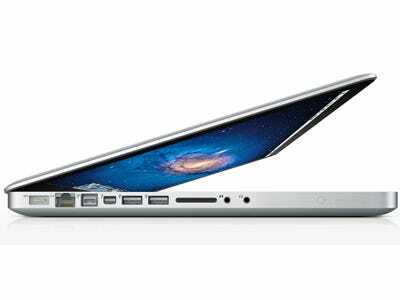 Apple may launch new MacBook Pro with with a huge 2880x1800 pixel display in Q2 next year, reports DigiTimes. By comparison, current MacBook resolutions range from 1680x1050 to 1280x800. Resolution like that will absolutely help differentiate the Apple brand in a big way -- comparable computers by Acer and Asustek currently have 1366x768 displays, and they're expected to up it to 1920x1080 next year as well. iOS: If you've taken a bunch of photos that you'd like to share with the world but the only tool you have to edit and upload them with is your iPad, Snapseed is a feature-rich photo editor that makes it easy to crop, rotate, adjust, filter, and then share your photos on Twitter, Facebook, or Flickr. If you're in a hurry, you can use the app's Auto Adjust feature to correct colors and levels and prep the photo for others to see in a single click, but if you're the type who needs more control, you can manually adjust the white balance, saturation, and contrast. If you want to apply effects, you can use Snapseed to make your image a tilt-shift photo, apply a vintage sepia tone, or focus on the center while blurring the background to make the subject of your photo pop. Snapseed is $4.99 in the iTunes App Store, and worth the price if you love using your iPad but don't want to put it down just to tweak your photos before you post them to Facebook or Flickr. Concierges are pretty awesome. 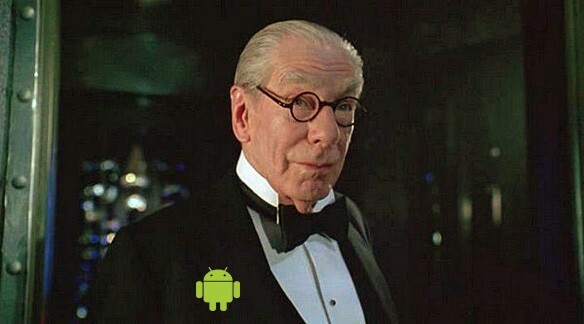 They're so awesome that Google wanted one and they're acquiring Clever Sense makers of the Alfred app. The app's intelligent recommendation engine should help Google get into the local "hey, where do you want to eat/drink?" space. 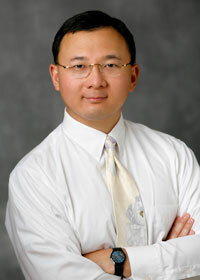 Alfred asks you about your favorite places in your area and from your answers creates recommendations. Connect your Facebook account and it starts tracking where you've been and what you like from the social network. Hit the green Ideas button and Alfred presents options like Breakfast, Dinner, Nightlife, Dessert, etc. Select a category and you're presented with places Alfred things you'll enjoy. Having your own personal concierge in your pocket is essential for city dwellers. I find myself eating at the same places over and over again. I purposely didn't add some of my favorite restaurants while teaching Alfred. The app still recommended those restaurants to me when I was looking for ideas. The app has been on the iPhone for a few months and it's time for Android users to start eating and drinking better with it. Video glasses are a pretty dorky vision of the future. I mean, put on a pair of blockers so you can watch video by yourself? A little bit anti-social, are we? Lumus wants to help a little bit by making glasses which let you watch video and see through the lens too. If imitation is the sincerest form of flattery, this falsified Fortis watch is pure adulation. Bet you can't spot the fake. The original Fortis-B-47 Calculator watch, which retails for $3,950, is swanky but expensive—self-winding movement, water resistant to 660 feet, stainless steel construction, the works. The counterfeit—by Digital Time Co., Ltd., Bangkok, Thailand—is identical save for a few minute, albeit expensive, details. It lacks glow-in-the-dark face paint, has buffed rather than brushed crowns, and uses incorrect temperature unit symbols. "The expensive details are left out, but the first impression is the same," says Christine Lacroix, managing director of Museum Plagiarius Solingen.